We are Manufacturer, Supplier & Exporter of Industrial Mixers And Blenders and our setup is situated in Miraj, Sangli, Maharashtra, India. We manufacture different types of industrial Mixer & Blenders which assures evenly Mixing of different Ingredients in various industries. The mixing may be powder - powder or powder - liquid. These may be continuous or batch type depending upon the application of blender. 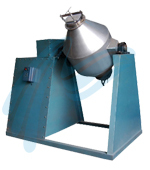 These mixers or blenders are designed for coefficient of variation ( CV ) less than or equal to 7. 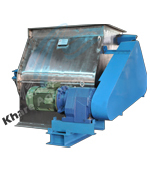 In batch type of mixers ratio of working volume and total volume are maintained to advisable level. Our industrial mixers and blenders are widely used in Animal Feed Sector, Premix manufacturing, Paint Industry, Pharma Industry, food Industry & chemical Industries etc. 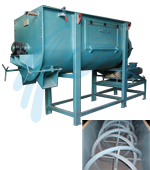 Discharge and Feeding of Mixer may be Manual, gravity, Pneumatic or with feeders like air Lock, screw feeder, belt feeder as per the requirement. Ribbon blenders, Double ( Duel ) Shaft paddle blenders, continuous flow type mixers & double cone ( conical ) blenders are types of our industrial mixers & blenders which we manufacture.